Exeter’s Michaelmas Term featured two major days of remembrance. On Sunday 11th November, the exact centenary of the armistice which ended the First World War, there were two services in Chapel. The first, which included the precise anniversary hour of 11 am, featured prayers both at the 1914-1918 memorial in the Ante-Chapel and at the Second World War memorial under Palmer’s Tower. The second, in the evening, used the format adopted annually at Exeter, including the laying of a memorial wreath at the altar. Fittingly, the earlier service was attended by the great niece of an Exonian memorialised in the Ante-Chapel. Three days later Exeter played a major part in a celebration of the life of that great Exonian, Sir Roger Bannister CH CBE (Physiological Sciences, 1946). This joint University-City occasion, a video of which is available to watch here, was organised principally by the four colleges with which Sir Roger was closely associated. Former Exeter Catechist Charlotte Bannister-Parker and I were among the speakers at the formal event in the Sheldonian; members of the Exeter choir helped to lead the hymns there; Exeter students served as stewards; and Thurstan Bannister (1979, PPE) spoke at the tea party which followed in the Town Hall. The term brought important developments for Exeter’s art and architecture. 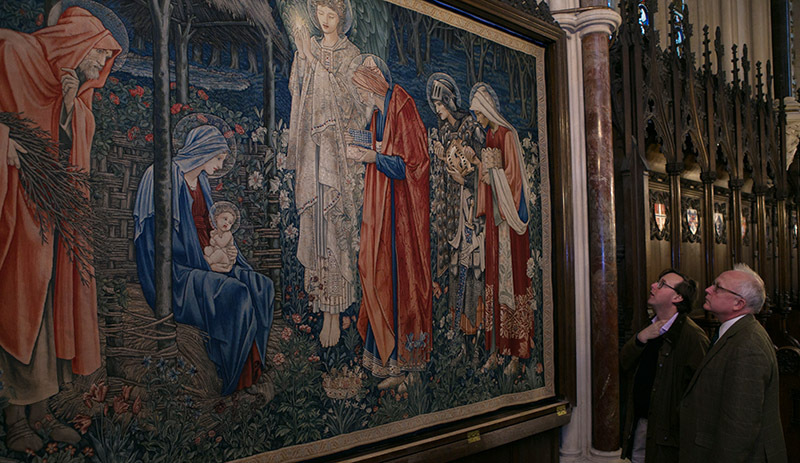 The major Pre-Raphaelite tapestry, The Adoration of the Magi, was re-installed in museum-quality display conditions in Chapel. Meanwhile, the designer of the tapestry, Exonian Sir Edward Burne-Jones became the subject of a major exhibition at the Tate Britain. At the end of term, Cohen Quad – designed by Alison Brooks – won first prize in the Higher Education and Research category at the World Architecture Festival. This was fitting recognition for a truly beautiful building which now plays a major role in the life of Exeter. 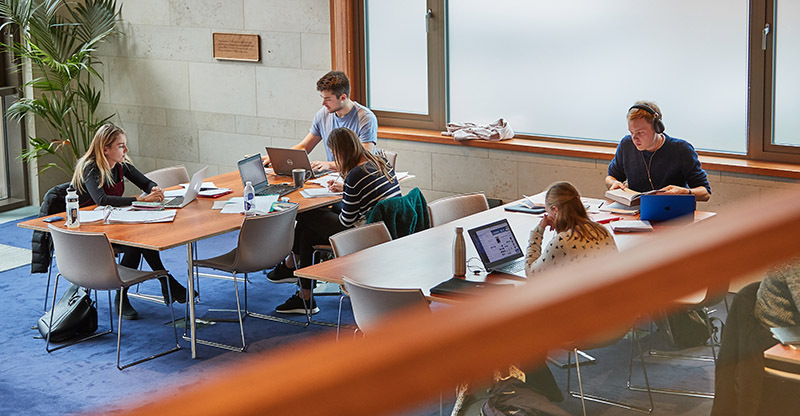 In terms of College business, there was considerable attention during the term to Exeter’s commitment – which features prominently in the College’s draft strategic plan – to increase the diversity of its UK undergraduate intake. Last spring’s decision to double expenditure on outreach is being implemented, and further major innovations will be considered in Hilary Term. As usual, Michaelmas Term featured a number of major dinners in the College’s much-cherished Hall, which was completed exactly four hundred years ago. There were lively occasions for undergraduate freshers, graduate freshers, scholars and exhibitioners, and major benefactors. 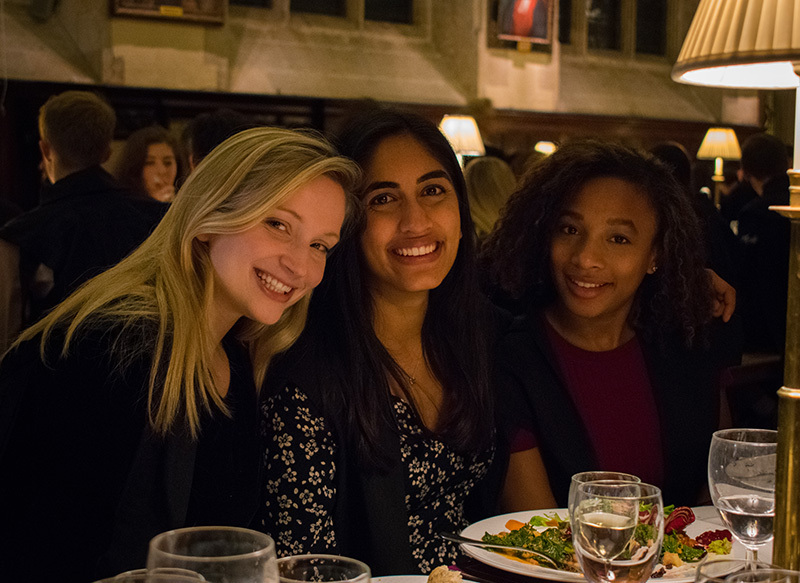 The now traditional celebrations of Diwali, Thanksgiving (enhanced by an inspirational speech by the director of the Williams-Exeter programme, Professor Lucie Schmidt) and Christmas were packed out, and Hanukkah was commemorated at the final ‘formal hall’ of the term. Likewise there were well-attended dinners for alumni and students in Medicine (addressed by Professor Marc LaForce, New York University) and in Earth Sciences (addressed by Dr Louise Biddle [2008, Earth Sciences]). The annual subject family dinners for Language & Literature, and Social Sciences, were well attended; as usual, each included a number of highly professional presentations by Exeter graduate and undergraduate students. Exeter Fellow in French Professor Jane Hiddleston gave the keynote speech (on ‘Creative Multilingualism’) at the former occasion, while at the latter Exeter Visiting Fellow Sean Hagan (until recently General Counsel of the International Monetary Fund) discussed strategies for eliminating corruption worldwide. The term also included the annual Symposium at Cohen Quad, a highly stimulating exploration of Digital Life. The speakers included Exonian Lydia Gregory (2006, Music), Oxford Professor Gina Neff and Exeter Fellow, Professor Luciano Floridi, who was recently appointed to the Board of the Government’s Centre for Data Ethics and Innovation. There were also three rector’s seminars. Exeter Visiting Fellow Professor Lawrence Weaver (Glasgow University), a child health clinician who is also a medical historian, gave a fascinating talk on ‘Human Milk – a Historical Perspective’. Another angle on health came from Professor Marc LaForce (New York University), an associate member of Exeter’s Senior Common Room. He highlighted a major triumph in his discussion of ‘Eliminating epidemic meningitis in Africa – a new vaccine meets a British strategy’. A creative combination of literary and political analysis came in the seminar by Exeter Visiting Fellow Professor Glyn Davis (Australian National University, and until recently Vice-Chancellor of Melbourne University) on ‘Thinking about Leadership: Alfred Lord Tennyson and The Temptation of Ulysses’. My major excursion of Michaelmas Term was to East Asia. In October Director of Development and Alumni Relations Pamela Stephenson and I visited Singapore, meeting many Exonians, especially at a reception in the Singapore Cricket Club hosted by Mike Coleman (1979, Geology). Our next stop was Nanjing, where we discussed collaboration, on the Exeter College Summer Programme, with that city’s eponymous university, representatives of which have twice visited Exeter in recent years. The next stop was Beijing, where at Peking University Exeter jointly sponsored an academic conference on the works of that major literary figure – and ‘household name’ in China – Exonian Qian Zhongshu (1937, B.Litt.). In the Chinese capital we also met parents of current Exeter students. Closer to home, the College held two alumni events in London during Michaelmas Term. The first, in November, inaugurated a programme of social occasions for young alumni. The second, in December, continued the tradition of ‘winter city drinks’ for Exonians (and guests) of all vintages. Another major alumni event was the choir reunion held in early November, commemorating the centenary of the death of that great composer, Exonian Sir Hubert Parry. Choristers from as far back as the 1960s returned; many sang in the choir during a particularly vigorous Evensong. Rector Cairncross and her husband Hamish McRae also attended. After a festive dinner the alumni choristers sang in Chapel a supremely inspirational rendition of Parry’s masterpiece, ‘I was Glad’. As the Brexit uncertainty remains unresolved at the time of writing, these are anxious times in the UK, as in many other countries. That makes Marguerite and me especially eager to wish a happy festive season to all Exonians, wherever they may be.